Well, Marly called an audible on today’s show. Instead of the regularly scheduled show she decided that today she just wanted to have a chat with an old friend. After meeting on a stuffed airport ride to the Long Beach Convention Center in 2010, Marly and Benjamin have become friends and colleagues. 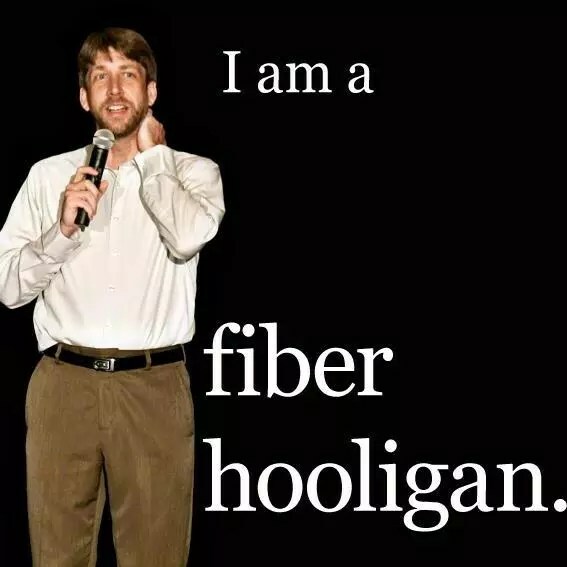 This episode was a great conversation about many things one of which was Benjamin’s new podcast, The Fiber Hooliganwhich can be heard live on Monday mornings at 11am CT. Since the show was really off the cuff and just a chat between friends they talked about the fiber industry, crochet, and just life in general. Now, you know that Marly and Benjamin can’t get together and NOT give away prizes! Yes, there were 3 prizes given away live but there was 1 prize that was a DOOZIE and is only available here! XRX is giving a Ticket to the Fashion Show and Fashion Show dinner AND Free Marketplace admission to any one of the 2013-2014 STITCHES EXPO’s (winners choice). That isn’t all, because nobody wants to enjoy the wonders of STITCHES alone the lucky winner gets to choose a friend to win the same prize!! Okay, if you are planning on going to any of the STITCHES EXPO’s in 2013 or 2014 you need to enter to win! WINNER WILL BE CHOSEN ON APRIL 1, 2013!!! SO…if you haven’t already listened to the show…go and grab a cup of coffee/tea and your needles or hook then sit in your favorite chair and listen to two fantastic people chat about life! Like this podcast? Be sure to leave a comment/review on iTunes to let other know about it! Stay up to date with the Yarn Thing podcast with the App available on iTunes and for Droid. This podcast is sponsored by: Knitter’s Magazine, Craftsy.com, Fiesta Yarns, Kollage Yarns, Decade by Drew Emborsky, Love of Knitting, Love of Crochet and Bijou Basin Ranch. « March is National Craft Month, How About A Giveaway?! Love thepodcast love xrx and stitches south…. First time listening to your podcast today. I enjoyed it very much! Knitters is my favorite magazine….and have been wanting to do a stitches so so bad. Can’t wait to get home and find your new podcast, Mr Hooligan! I loved listening to this podcast. How absolutely fun! I AM planning on attending Stitches Midwest in August. You can randomly pick me 🙂 I NEED to meet you both! I’d love to win a ticket to stitches East fashion show. Thanks for a great episode. Have never been to the fashion show dinner and would love to go! What a great afternoon-first Benjamin’s podcast and then yours. I had a fantastic time at my first Stitches East this year. The show had such a warm vibe in every part of my experience there. Getting a chance to go to the fashion show and dinner at the next one would be amazing. My first time listening to your podcast and I really enjoyed the interview with Benjamin. You can be sure I’ll be listening from now on. Looking forward to my first Stitches East – Would love to attend the fashion show! I would love to win for stitches west 2014! Sure hope to see you at Stitches East this year! Marly, best teacher ever, and Benjamin give out the best prizes ever!!! I’m sure you would be the best teacher ever and hopefully I will find out with a live class someday or through Craftsy. I enjoyed listening to you and Ben chat. I find out about so much of the latest and greatest from your show. Interesting show! I went to Stitches Midwest for just the Saturday last year…. would love to win those tickets! I would bring my LYS owner if she could get away! If not, then one of my other knitting buddies. Thanks! Great show! I’d love that prize for Stitches Midwest. I’ve never been to the fashion show! What a fun listen today. Lovely prizes too. You & Ben are such fun, nice people. I’d love to attend a stitches show… I’ve thought about going in the past, but I’m one of the crocheters that Marly says has no confidence. Maybe winning the prize would help! Great show Marly… and I’ve already subscribed to Ben’s new podcast. What a great conversation, and what a great prize! I went to Stitches West for this first time this year, had a super time, and I’m already planning to make the trip down from Seattle to attend again next year. I love Stitches Midwest and would love to see the fashion show. I am attending Stitches South this year and would love to go to the fashion show. What a great prize & a wonderful podcast. Thanks you guys! Marly- I just heard about Stitches, and I would love to go to Stitches Midwest! I thought I was living in a yarn-obsessed bubble, and I would love to meet others who share my love of yarn and crocheting! I enjoyed the banter between friends. Looking forward to taking my Crochet class with Marly at Stitches Midwest – and I have to say Marly, you are exactly right in your assessment of my crochet skills! !